The sun heralded our entry into Finland. It was such a relief after the misty cold at the North Cape in Norway. Apparently June was the worst June in Norway for a long time. We found a lovely campsite in Inari on Lake Inari which is the largest lake in the north of Finland. The Sami Museum in Inari is very well set up. It focuses on the indigenous Sami and the northern seasons showing how nature and people have adapted to the extreme conditions of the northern environment. There are photographs, videos, dioramas, sound-scapes and original artifacts, in fact so much information on the environment, animals, plants and people that it is impossible to take it all in. There are also dwellings outside that have been moved to the museum from other parts of Finland. Apparently Inari is the oldest known inhabited area in northern Lapland. Next stop was the Bear Cafe further along the road. There is a viewpoint of Lake Inari and yes if you look very closely you can see it on the photo in amongst all those trees. What amazed me was not the view but the path leading up to the view. It is made of wood, with flat areas, steps and handrails. Heaven forbid someone had to walk on the uneven ground. I should not be so cynical though, even with all the help there are enough steps to make it quite a hike, we both had sore muscles afterwards. There was the inevitable souvenir shop and a cafe selling meals of fried or smoked fish or reindeer meat. We both had the reindeer goulash with mashed potatoes and a berry sauce. Plain but OK, it tasted a bit like lamb. We also shopped at the northernmost Lidl. For those who do not know Lidl, it is a German supermarket chain with branches throughout Europe which sells good quality food items at a discount. Very good for our budget as we have just discovered that the Rand exchange rate with the Euro has worsened. Rovaniemi is the home to Santa Claus, at least the Finnish say so. It has a big Santa shopping Centre on the Arctic Circle and closer to town, Santa Land. We stopped at the Arctic Circle for the traditional photographs. There is an area for campers but unfortunately it was taken over by volunteer fire fighters, there for training. Instead we found a nice spot in the forest with only a few mosquitoes and rested for a few days. After a late start we headed south. Unfortunately the scenery in Finland consists of trees, trees, more trees and the occasional cultivated field, the towns are small and lakes can sometimes be glimpsed through the trees. No wonder that, like in Norway, wood is used to build almost anything: houses, bridges, office blocks and -shops, power pylons and so on. Finland is great if you want to spend time relaxing and pursuing water sports in summer and snow sports in winter, along with hiking though. For driving through, at the end you don't see the trees through the woods, so to say. 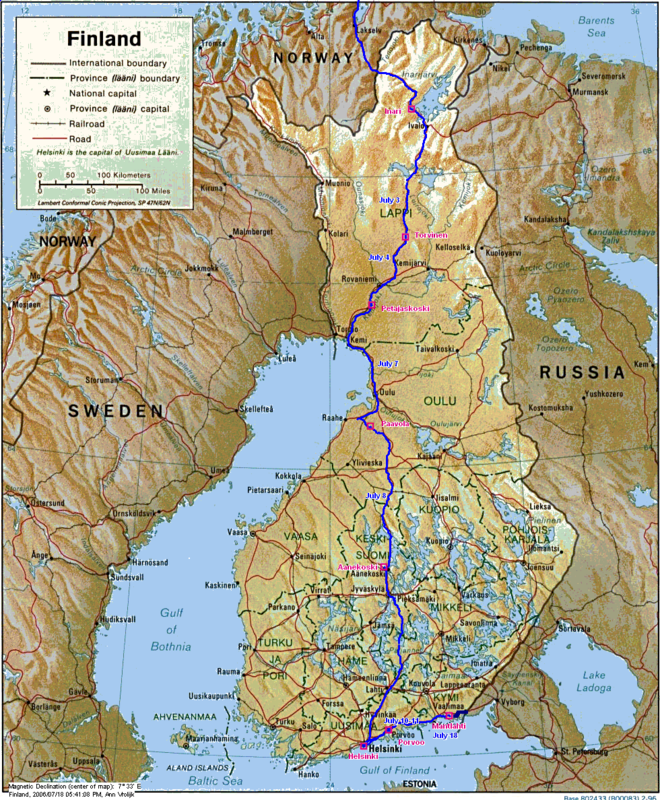 We would like to see Helsinki and so we are heading directly south through the area where there are the majority of lakes. The fields have drainage ditches due to the high ground water level. They are really pretty when filled with wild flowers. There is a petrol station and restaurant on the main road where the owners have a large number of bells set out under several roofs and also in the open. The bells were made in the twentieth century and come from all over Europe. Visitors were encouraged to gently ring them. Even a gentle ring is very load. We have decided to reduce costs by traveling more slowly and found a lovely secluded spot where we could relax in the sun and Pieter could practice shooting. There may be many large lakes in the area we drove through but it is always difficult to see them as there are always trees between the road and the lakes. You have to take secondary roads and hope they do not end at someone's house rather than a lake. We met some campers, Brian and Carlotta, who love fishing and they had trouble obtaining access to the lakes. 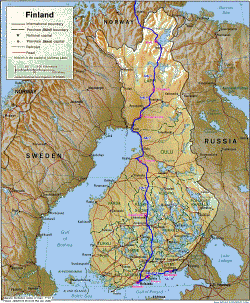 However they also had friends in Finland with a lake on the doorstep. The first item on the agenda in Helsinki was to find the Russian Embassy which, naturally, was only open in the mornings. After that we walked around imbibing the atmosphere. Along the Esplanade there are many buskers playing Jazz, classical music and pipes. It was lovely to just sit and listen. We also saw a woman who had trained 3 cats to perform. They walked along a rail, jumped up onto a high platform and jumped up into a basket. Amazing to watch. The cats behaved like typical cats. They knew what they were supposed to do but not just at the snap of the trainers finger. Oh no! Each would walk around a little bit, look disdainfully at the crowd and with an almighty sigh decide they may as well get on with it. I think training cats to perform must be very difficult. There is also an open market and a covered market. The main fresh food available were large, sweet cherries, small very sweet strawberries and peas. Interestingly many Finnish people bought the peas, sat on a bench and consumed them immediately. The tourists bought the cherries and strawberries. We had some long life cream to go with our strawberries. There was also cooked fish for sale. The mixed plate looked great so we bought one each. There was salmon, Baltic herring, whitebait, thin slices of beef, rice with vegetables, onions, salad and a creamy sauce. Absolutely delicious and way too much. We had dinner the next night from the leftovers. Tuesday morning was spent at the Russian Embassy. This was a waste of time as a transit visa is for one day only (we had hoped for a longer one) and you need an invitation for a tourist visa and proof you would leave the country. They advised us to go to the travel agents down the road. There they promised to sort everything out and proof of exit did not matter. It would however take a week. Porvoo is the second oldest town in Finland. The current wave of settlement started in the 12 century. The town has been burnt down many times but the atmosphere is relaxed, friendly and there is a hotspot for internet. We have spent the week walking around, catching up on news, eating cherries, strawberries and ice-cream and twice staying in a campsite to wash clothes, shower, pick up water and empty the Porta Potty. After a quick trip to Helsinki to pick up our passports we headed for the Russian border. We will enter tomorrow to maximise our 5 days.